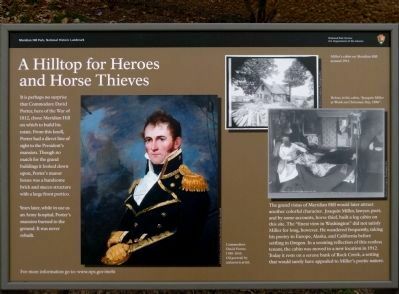 It is perhaps no surprise that Commodore David Porter, hero of the War of 1812, chose Meridian Hill on which to build his estate. From this knoll, Porter had a direct line of sight to the President's mansion. Though no match for the grand buildings it looked down upon, Porter's manor house was a handsome brick and stucco structure with a large front portico. Years later, while in use as an Army hospital, Porter's mansion burned to the ground. It was never rebuilt. The grand vistas of Meridian Hill would later attract another colorful character. Joaquin Miller, lawyer, poet, and by some accounts horse thief, built a cabin on this site. The "finest view in Washington" did not satisfy Miller for long, however. He wandered frequently, taking his poetry to Europe, Alaska, and California before settling in Oregon. In a seeming reflection of this restless tenant, the cabin was moved to a new location in 1912. Today it rests on a serene bank of Rock Creek, a setting that would surely have appealed to Miller's poetic nature. Location. 38° 55.381′ N, 77° 2.182′ W. Marker is in Columbia Heights, District of Columbia, in Washington. 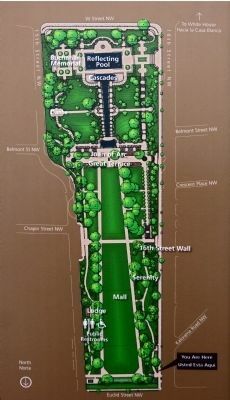 Marker is at the intersection of 16th Street and Euclid Street, on the right when traveling north on 16th Street. Touch for map. 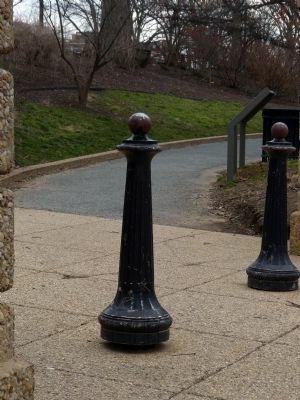 Marker is at the north west entrance to Meridian Hill Park along 16th Street just south of Euclid Street. Marker is in this post office area: Washington DC 20009, United States of America. Touch for directions. Other nearby markers. At least 8 other markers are within walking distance of this marker. Life on the Park (a few steps from this marker); Campus to Army Camps and Back Again (about 300 feet away, measured in a direct line); Embassy of the Republic of Lithuania (about 300 feet away); Lithuania's March to Freedom (about 300 feet away); Visionary and Park Champion (about 400 feet away); Creating the "City Beautiful" (about 400 feet away); Design Challenges (about 400 feet away); Park Designers (about 400 feet away). Touch for a list and map of all markers in Columbia Heights. 3. 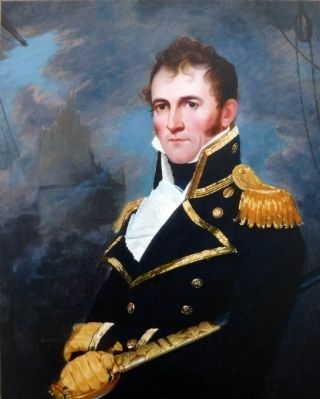 Commodore David Porter 1780-1843. Oil portrait by unknown artist. Miller's cabin on Meridian Hill around 1911. 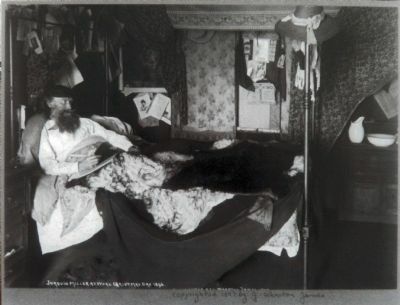 In his cabin, "Joaquin Miller at work on Christmas Day, 1896." 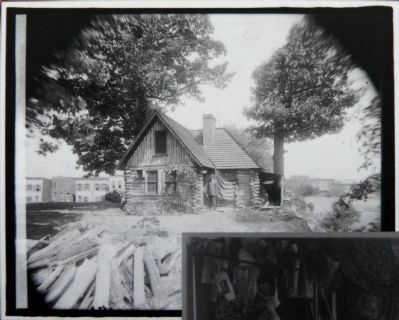 "The L-shaped cabin was built in 1883 at a site near the intersection of 16th and Belmont Streets, NW across from what is now Meridian Hill Park ... 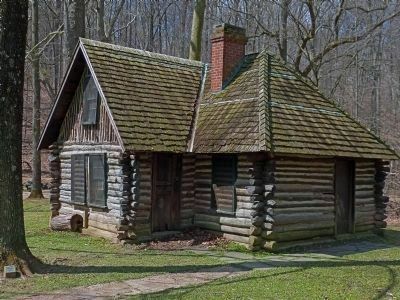 In 1911-1912 the cabin was disassembled and moved to its present site and dedicated on June 2, 1912." -- NPS Classified Structures Report. More. Search the internet for A Hilltop for Heroes and Horse Thieves. Credits. This page was last revised on November 20, 2016. This page originally submitted on March 13, 2013, by Allen C. Browne of Silver Spring, Maryland. This page has been viewed 713 times since then and 7 times this year. Photos: 1, 2, 3, 4, 5, 6. submitted on March 13, 2013, by Allen C. Browne of Silver Spring, Maryland. 7. submitted on April 1, 2013, by Allen C. Browne of Silver Spring, Maryland. • Bill Pfingsten was the editor who published this page.